... 1951 (60 years ago today), a half-hour situation comedy featuring a kooky redhead, her flummoxed husband, and their sidekick neighbors, premiered. I Love Lucy was the name for the show, which starred Lucille Ball (1911-1989), an American comic genius of her generation. It would run for 6 seasons. 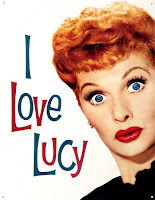 Commentators debate whether this show had a feminist angle; feminism was easier to find in a successor, The Lucy Show, which featured Ball as a widow and her neighbor as a divorcee.